Meta-analyses have been increasingly used in the scientific evaluation of efficacy and safety in benefit-risk assessments, as well as for pricing and the reimbursement of biopharmaceutical products. Over the years the outcome of meta-analyses has been both debated and used as evidence within the regulatory process for human medicinal products, and their interpretation has sometimes contributed to different regulatory actions for the same product. Working Group (WG) X was established based on suggestions from several parties, bringing together senior scientists from drug regulatory agencies, the biopharmaceutical industry and academia. The objective was to develop a consensus on scientific and methodological criteria that represents good practices when applied to meta-analyses of clinical data within the regulatory process. The aim is that these criteria will then be used by both industry and regulators. During its first meetings the WG decided to focus mainly on meta-analyses of safety data and the title of the WG was revised to reflect this. The members of the WG anticipated that with increasing amounts of data available in digitized form, publications of meta-analyses of clinical data will likely increase. Apart from methodological caveats, they identified the following issues: access to relevant unpublished studies and data submitted only to regulatory agencies or remaining in the files of biopharmaceutical companies, availability of sources of data, the possibility to interact with the researchers involved in the original studies and the resources to re-analyse available data. The WG aimed to develop a recommendation of a harmonized view on these issues. Another controversial issue is the combining of available information from both randomized clinical trials and epidemiological studies to generate an integrated result. The WG elaborated criteria as to how this should be done, particularly for safety data, and established general principles. 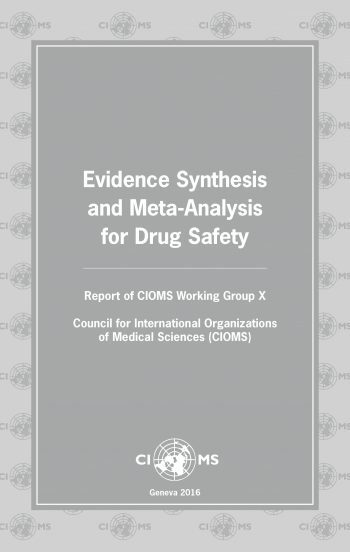 The report of this WG, Evidence Synthesis and Meta-Analysis: Report of CIOMS Working Group X, was published in August 2016.